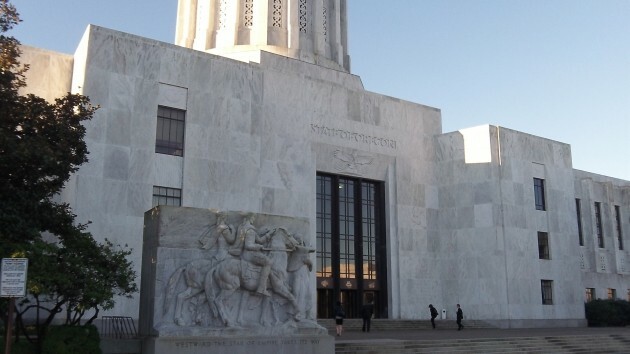 Having failed to screw up the Oregon economy with a cap-and-trade scheme on greenhouse gases, Democrats in the legislature are promising to try again in 2019, and then they aim to succeed. Senate President Peter Courtney has vowed that the 2019 assembly will pass this climate-change measure and anybody against it had better not show up, or words to that effect. But if facts rather than emotion counted for anything, this effort to increase regulation, the size of the state bureaucracy, and the cost of everything that depends on energy would have no chance. The complicated program of regulations and other provisions proposed by Democrats during the short session this year took six pages of dense type just to summarize. It would have empowered the appointed Environmental Quality Commission to set limits on the emission of carbon dioxide and other greenhouse gases. But emissions beyond the limits could continue as long as the industries affected paid the state money for “allowances.” The revenue would be used to fund various programs to promote favored industries, regions or companies that could claim to combat climate change. Voters should demand to know exactly how this scheme would prevent what changes in the climate of Oregon, the country or the world. And how much this would cost. The legislature has no firm information on any helpful effect that this plan would have. But it has been provided definite data on the harm it would cause. Among the latter, it has testimony from the Ash Grove Cement Company, which operates Oregon’s sole cement manufacturing company in Durkee in Baker County. The plant has 112 employees and has been around for 135 years. The Democrats’ climate bill would force it to shut down. The company says it costs about the same to import cement from China as it does to buy it from the Durkee plant. If the plant had to pay for state “allowances,” it would have to go out of business. And because China uses largely coal-fired electricity to sustain its cement-making capacity (15 times larger than that of the U.S.), the Oregon bill would cause an increase in global CO2 production of roughly 380,000 tons per year. Give me a Republican Party that can focus on fiscal responsibility and Democratic eco-frauds like this cement thing (and maybe the plastic-bag bans) and I’ll be happy to join wholeheartedly. What’s holding me back is almost everything else, and our President. For 6 pulp mills and that cement plant, this finagle taxes fuel consumption as well as a byproduct of production. It’ll certainly clear local air. The plants are in a cost-price squeeze eith no identifiable process alternative. Charlie Koch speechifies about creative destruction’s necessity. But then, he’ll never miss a meal. While Mr. Cement says the concrete will have to come from China, he doesn’t mention he owns 6 other cement plants in the USA, plus a whole lot of that could sell it too. He also says that the other plants put out a LOT less mercury than the Oregon plant. Here is a link to all the places Ash Grove Cement has in the United States. there are cement plants in Washington, Montana and Utah, among others, and cement terminals all over the place. China? Really??? It’s all about greed, and not being a responsible businessperson. If you can’t compete in the marketplace, you should fail. Before you get jazzed up about greed, get caught up. For years, the attack word was mercury. It’s not typicslly tested. Just assigned ad a multiplier to production. They converted from oil to nat gas when they could afford the conversion (fracking drove nat gases crazily down). SOx and NOx dropped precipitously. I’m willing to meet you halfway. The mercury problem is a big deal and appears to be uniquely bad there. Carbon dioxide released from limestone is equally unavoidable anywhere on Earth; I mistakenly assumed that was the entire issue. Ash Grove had been aware of its mercury emissions for some time, and Kerby [plant manager] said the company addressed the problem. “We have 1,100 parts per million of mercury in our limestone [yikes! ], whereas in other places it may be five parts per million,” he said. The 55 pound limit was in effect in 2012, and may have been reduced to 21 pounds since then. (See the article and EPA link from there). In other words, their emissions are either 2.5 or 6.5 times too high. Ash Grove would rather be graded by effort than by results (see the article). That’s not good enough for the health of everyone in the area and down river. Is it all about greed? Probably not worse than all human enterprise on average. While that may be true, We live in Oregon and value our clean air/water, etc. When was the last time an industrial entity in Oregon (or anywhere else for that matter) put the environment ahead of profit? Nope, to my recollection, any/all industrial business/complexes have had to be mandated to comply with clean water/air standards. I’ve yet to hear or read that a business has used their largesse to intentionally try and improve over & above the absolute bare minimum. We tend to have short memories of when the Willamette and other Oregon rivers were literal cesspools due to the environmental acumen of businesses. Tom McCall ! He was part of a “GOP” that knew how to govern. Seems to me that group is long, LONG gone. Instead it has morphed into something else. Something dark & disgusting! And shows no signs of ever returning. Is there a 3rd way? A third party to emerge? A little story about regulation spinup in 1970 for pulp mills. The first sulfur emission limit was high (300ppm) comes to mind. Impossible, they said. But then the operators changed some parameters and 300 was easy. . 70 was tougher. By the time the 10 limit came along, we needed technology. The ppint of this tale is that the early, big gains used mental capital. Without that investment, the capital that got us to the final limit would have been wasted. Wood’s typical rant–private business is greedy. Bureaucrats love to spend other folk’s money—that’s where the greed is. BTW, Tom, it’s Woods’ not Wood’s. Simple grade school mistake. Bureaucrats do spend money, but it’s to provide services, and to work to improve the health and welfare of all the citizens, as provided through laws as enacted and directed by the lawfully elected representatives of all the people. You on the other hand, relish filing lawsuits that drive up the costs of getting those things done. Llike your recent threat to sue the city to prevent them from stopping raw sewage from entering streams and rivers. What a guy! Maybe we should borrow from that old Stanley Kubrick movie and refer to you as Dr. Pooplove. I intended to ignore your inane comments as we all know what your political leanings are but I must comment on your greed comment. The absolutely greediest people in Oregon are PERS retirees who through absolute fraud by the union and the Dem governors have created a pension fund 25 billion in arrears with no hope of catching the bouncing ball. When I was on a local school board we paid 6% of salaries for Pers pension. Now Gaps is paying over 20% of salaries and still the fund is going under. No where have I heard 1 retiree say the obscene pensions paid should be reduced as there is no way Oregon ever catches the bouncing ball. If PERS was a private pension plan the feds would take it over, reduce the pensions payouts and the officials who violated their fiduciary duty would face legal action. Well Al, even with your inane comments we agree. Decisions made by the PERS board in the early 1990’s were atrocious. Tier 1 employees ended up with a windfall that was not appropriate. Yet, the Oregon Constitution has tied the hands of other changes because of its strong contract law provisions. I’m a Tier II employee. When I retired 3/31/2015 my first PERS monthly check was $2,197.47 after taxes. Last month, over those 3 intervening years, it was $2,098.21 after taxes. Yeah, it’s less because taxes have gone up and because of the “adjustments” the state put in to try and keep the cost down by deferring some cost of living increases, I get less money now. So Al, my income from PERS is a public document. I’m happy to share it. I was a Director, one of the higher paid people in the City, and I’m damned glad that my parents taught me well to SAVE my own money for retirement because I built up a big nest egg so I am not at all reliant on only my PERS income. In other words Al, blow it out your hindmost orifice. Granted political parties have morphed since 1946, but wasn’t PERs a creation of Republicans? Either way it was created because the leaders at the time didn’t want to pay a decent enough wage to teachers so that they could save for their own retirement so they kicked the can on down the road. Something the older generations have gotten quite good at and in reading the comments here about not wanting to tackle climate issues it seems that kicking the can down the road is something older people still enjoy.